It is so hard for me to believe that it is the last morning of 2010. Time is so quickly passing- or so it seems doesn't it? The truth is - time moves as it always has. But here we are at another ending and another beginning. When I sought something encouraging to write this morning I looked the above verse up in my Bible's concordance, wanting to focus on the new mercies of God EVERY morning. I wanted to remind us all that each day - not just each new year, is a blessing from Him. I was wanting to focus on the newness of the beginning. As I read the passage and began to type it, the first verse was what really struck out to me. "The steadfast love of the Lord never ceases; his mercies never come to an end;"
You see ladies, everything we see will cease. Just as 2010 is ending, so will 2011, if the Lord tarries. Creation is deteriorating awaiting His return. Everything is on a downward spiral awaiting its end. Everything we know has a conclusion, a God ordained, planned end. Everything except Him. His steadfast love never ceases. His mercies never come to an end. So today, I am not going to focus on the ending of 2010. I have decided not to reflect on its highs and lows. (When the author of Lamentations wrote this, he had seen his whole world fall apart!) I am not even going to make plans for 2011, or allow myself to dream about what the new year may hold. I am going to purposefully, intentionally worship my God, my God who knows no end and has bestowed His eternal blessings upon me. Praise His holy name sisters! We have much to worship Him for! It is nice to be home. Last night we returned to Clarksville from visiting my family in the Dayton, Ohio area. We had a wonderful Christmas celebration there, enjoying the fellowship with friends and family. However, my youngest and I ended up fighting a stomach bug. We were quite ready to sleep in our own space and in our own beds. We had a blessed Christmas season and I found myself yet again amazed that our Mighty God would come to earth, to live among His creation as a poor carpenter's baby -born not in a mighty mansion but a barn, laid not in a golden crib but a feeding trough for smelly livestock. Ah, yes God is good. I look around my house now and there are bags to unpack, laundry to be done and Christmas goodies to put away. There is no doubt that there is a ton to do. But I am thankful to be here. I am thankful for today. I am thankful for my incredible God. Now, to make some coffee and unpack my Bible. I have some time I need to spend in His word. I hope you have had an amazing Christmas holiday. Please feel free to post what God has shown you this holiday. Where I am sitting I can hear the waves crashing on to the shore and can see the beautiful, powerful water rushing in and out of the Atlantic Ocean. When I go to bed at night and wake in the morning I hear the sound of the powerful sea. Calming. Powerful. This morning, however, they are frightful. Dark. Angry. As I reflect on the sea and the waves that can at times be beautiful and calming and at other times be dark and dangerous and frightful I think of how this country we are visiting our son in (Dominican Republic) is much the same. We can go to beautiful beaches, quaint restaurants, and see beautiful homes and at the same time see poverty and dirt and pain. Nothing has hurt my heart more than the prostitution that is legal and rampid in this city. I have heard about it all year as our son and daughter-in-law tell us about how the city they live in is well known for its prostitution....men from Europe and all over the world come here just for that. I was disturbed and concerned and prayerful all along....but yesterday I saw...and have been changed. As we were walking down the street coming toward us was an older man holding hands with a beautiful, young girl...maybe 14 or 15...with empty eyes....and the Lord gave me a glimpse of what is happening. All night I have not been able to sleep thinking/praying for these young teens whose lives are nothing like a teen's life ought to be. Ladies, would you please join with me in praying for these girls? These men? The missionaries here who are trying to do something about this? I wanted to grab her and take her home with me...it is rampid and it is open and it is acceptable here. How did that happen? Lord, open our eyes to see what You want us to see...then give us an urgency to pray for Your beautiful girls all around the world. Today, Father, may each one get a glimpse of how much You love them. Ernie and I arrived in the Dominican Republic December 21st to spend Christmas with our son and daughter-in-law. They moved here one year ago to do missions and this is our first time here. I am pictured here with a precious little girl who kept "eyeing" me at her school party...those eyes were begging me to let her sit on my lap...and I was longing to do it!! All week I have been pondering, praying and wondering what God would have me share with you this Christmas week....and honestly, I am mute....and I am not sure why....but there is one thought that keeps permeating my heart. Christmas here is so different than in the States. I am not rushing here and there. Not many lights and decorations or Christmas songs and shopping or trees and cold weather...but there is Christ and His provisions and His laborers and His people. We have worshiped in Spanish where I knew no words and in English where I knew no people other than my family. And even though things might not "seem" like Christmas....Christmas it is because Christ came. Friend....perhaps something has happened this year that finds yourself saying, "it just does not feel like Christmas". We know that the truth of the matter is that even if we have no tree, or lights, or cards, or snow, or songs, or family, or tradition or Santa....it is Christmas!!! Perhaps next year we should go without all of the "stuff" that makes it "feel" like Christmas and just focus on Christ! So, I have a very important question for you….I would LOVE to know what you do about sending out Christmas cards. Deep huh? Seriously, what do you normally do?? The task can be overwhelming and quite expensive and I really want to get your ideas and suggestions that have worked for your family. 1. Not send them at all? 2. Put one for each family in the RA or GA “Lottie Moon” Christmas mailbox? 3. Put one for some families in the “Lottie Moon” Christmas mailbox? If so, how do you determine who gets one and who does not? 4. Mail only to those who are out of town? 5. Mail to everyone at church? 6. Mail to certain ones at church? If so, do you run into the same dilemma as number three above? Who gets one and who does not? 7. Send one to everyone who sends you one? 10. Say it in the December newsletter? You see, we have not given a card/letter/picture to every family in our church…but I would LOVE to!! BUT I also really want to write something personal on all my cards…not just a signature…so time is an issue AND not to mention the expense!! I truly want to wish our church families a Merry Christmas and honestly would LOVE to know what you do and what has worked for you! How do you wish your church Merry Christmas? I can smell the food now. Mom standing the kitchen making our traditional Christmas family feast which we call Mexican Fiesta. Yes, instead of the classic turkey or ham with trimmings, our family chose several years ago to go with homemade enchildas, salsa, rice, beans, and chips. Mom spends days preparing chili for beef enchildas and cooking chicken for her special chicken sour cream enchildas. Oh man, my mouth is watering! Unfortunately, this year my husband and I will not be traveling back to southwest Arkansas for Christmas. Instead we are spending Christmas here. We are have explained to our families this year that it will be impossible for us to get away due to ministry obligations. They understand but are sad. Instead I plan to cook a small meal for my husband, son, and mother/father-in-law. Sadly, many ministering families live great distances from their families. Missionaries often cannot travel home for holidays. Instead they use the time to invite the people they minister to into their homes. Some ministers of local churches open their homes to senior adults who might be alone for Christmas. This year we will join our church family for a wonderful Christmas Eve service. On Christmas Day we will celebrate quietly at home. We will make a Christmas Day phone call to my family in Arkansas and pretend we are there in our dreams enjoying the Mexican Fiesta. My men will watch football for hours and I will find a Christmas movie to enjoy. More importantly we will carry on our family tradition of reading the Christmas story of Jesus' birth. So ladies, I wish you a blessed and happy Christmas. I pray you will be renewed for the coming year. Well, if you live in the middle Tennessee or eastern part of the state, I know you experienced the snowfall yesterday. I found myself humming "I'm dreaming of a white Christmas" all day along plus I cannot tell you how many cups of hot chocolate I sipped. I mean, I got to experience three of my favorite things-snow, Christmas song, and chocolate! Seriously, as I watched the beautiful snow drift down toward earth, I got all warm and fuzzy inside and began to think about God. First, snowflakes are so delicate and each one is unique. Can you imagine no two flakes are alike? Only the God of the universe could create infinite possibilities of snowflakes! In the same way our Heavenly Father created each of us to be unique individuals. Our possibilities are endless. Second, snowflakes are white. I wonder why God did not choose to provide different hues for snowflakes. I think a few blue, pink, and purple flakes would provide an interesting mix until they melted. Then, the colors would mix together and become some ugly, nasty color. No, I like to think our Father chose the color white to remind us that our sins are forgiven and we are washed white as snow. Third, as the snow fell yesterday, gust of wind would blow the flakes in circles. At times the snow and wind mix became a total chaotic blur. I began to realize that our lives are like the snowflakes. We are delicate and unique but sometimes the storms of life blow us in all directions. Unless we keep the Father close by we will find ourselves in a chaotic blur as well. As Christmas approaches, I hope we have another snow. I have never experienced a white Christmas but I personally think it would add a magical element to the day and a quick reminder that Jesus came to earth to forgive us of our sins and make us white as snow. Share Thought for Today: What is your favorite Christmas memory? The Christmas season is upon us. It's the season for shopping, decorating, parties, and family gatherings. It's the season for feasting on holiday favorite foods. It's the season for just one more excuse for eating chocolate yummies like homemade fudge. Yes, tis the season. More importantly it is the season for celebrating the birth of our Savior. If God had not sent his only Son to us, we would have no reason for the season. We really would not need a Christmas tree with all the decorations. We would have no need for gift giving and family gatherings. We would not display our nativity scenes. It would be just another ordinary day in the life of ordinary humans. Let's remember in the midst of the holiday chaos that the real reason for the season is Jesus' birth. 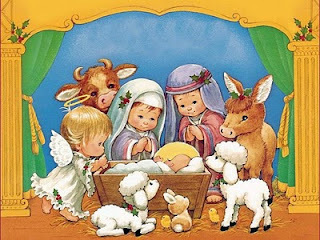 it is the time when He left His throne in heaven to be born in a lowly manger. It is the time when God looked down from heaven and showed His ultimate love for us. Yes girlfriends, this the Season! This past summer my pastor preached a series on joy. I so enjoyed it because our family has always felt our journey has been one of joy. Please understand, it has not been easy, but we have learned much about the 'full joy' Jesus referred to as He taught His disciples. As we walk through this season the word joy is everywhere. It is on banners, cards, clothes, in songs and sermons. The angels used the word joy in the announcement of the birth of our Savior. In spite of all the reminders of joy, we are often faced with joy stealer's in our everyday walk. I want to share with you a brief portion of the sermon I heard that may help as you seek joy in this season. The scriptures used were from Philippians. I truly believe joy is wrapped up in gratitude. Take some time to tell your family how they bless you, tell your friends the blessings they bring into your life, share with those you serve how blessed you are to serve them. As the decorations go up and the kitchen becomes the center of activity we have a tradition that is not one we chose. This is the time of year I travel to Houston to MD Anderson for all my cancer tests. I will walk into the hospital early in the morning and walk out that evening. I will be poked, prodded, stuck, have xrays, mri's c-scans, drink awful stuff and have radio active dye put in my veins. It is a long day that often includes some pain. The hospital will quietly be playing Christmas tunes and there will be trees and decorations throughout. I will see thousands of people as I walk through the day. Some will be smiling, some will be crying, some will be sleeping while waiting, all are hoping for good news. This has become a family tradition for us. My sons wait for the call at the end of the week. They pray for good news. We all hope that Christmas will be cancer free. We are grateful if the news is just - no change. I have to tell you that hearing the words cancer free would be good news. I have actually never heard those words since I started this journey, yet I am for the moment very healthy. As I think about the good news that all those people in Houston want to hear, I am aware that we all have the "Good News" that they need. Jesus is our Good News. We know that, we hear it every Sunday and at every Christmas party, but are we sharing with those around us? Are you aware of the need in the lives of those around you for Good News? Take time to notice those God brings into your life. Share with them the ultimate Good News. This year’s theme is “COME AWAY WITH ME-- God." Registration begins at 1:00 on Thursday and the last session is at 11:30 on Saturday. You will not want to miss this year. Featured Personalities scheduled are: Roger Britton, Randy Davis, Jeanne Davis, Jamie English, Jr., Charles Foster, John Franklin, Diane Gilder, Ray Gilder, Michael Kelley, Al Mahan, Don Person, Trish Pierson, Tony Rankin and our own Lana Rose. Cost: $175 per couple which includes your hotel, meals and breaks. Deposit is due by 12/15/2010. Full payment due 1/15/2011. No Refunds after 1/25/2011. If you have never attended, please make plans to do so. I promise you will not be disappointed. Roger and I have been attending for many years. Our first retreat was back when it was held at Fall Creek Falls. Our deacons had seen the retreat advertised and decided that they wanted to send us to it. I did not want to go. I was burned out. I had smaller children and no one to watch them and to be honest with you, at the time, I felt that I needed a vacation, but certainly not to some ole conference where we had to sit and listen to preaching all day and act “spiritual”. I was not feeling very “spiritual” at that time. Anyway, my husband said we had to go because the deacons wanted us to and the church was paying for it, so we drove to Alabama and brought my mom back to watch our kids and off we went. The retreat was NOTHING like I expected. There was a room full of pastors and wives that felt JUST LIKE WE DID. Everyone was stressed, burned out and needed a break. We got to let our hair down and just RELAX. We have never left a retreat that we were not refreshed and uplifted. Our church continues to send us every year. They say it is money well spent because their pastor and his wife come back with a burst of energy and on fire for the Lord. They reap the benefits. I might mention that once we settled down and relaxed, then we did have great teaching, sharing, singing, entertainment and preaching……..but it was ALL GOOD. Roger and I look forward to the retreat each year. It is a time of refreshing, renewing, and LOTS OF FELLOWSHIP with the friends we have made over the years. We come away with a booster shot that lasts us until the next retreat. Send in your registration and I look forward to seeing you in February. As you are reading this, I am sitting at a Technology Conference in Nashville. The school system sends me to this conference every year. Not only do we learn the new and up-to-date technology skills, it is a great time to relax and slow down from the crazy holidays. We live almost three hours from out moms and it was very hard during Christmas with young children, so I thought that as my children got older, it would get easier. NOT!!! Now, not only do our families live almost three hours away, we have two grown children that live in different directions also, so now we REALLY have to shuffle and be creative to fit everything in. Of course on the bright side, Christmas is not over in a day or two………it takes a month or two to fit everything in…between our church activities and family activities. Smile. The important thing is to slow down, take a deep breath and remember what the holidays are all about. Sometimes we get so caught up in the “celebration” that we forget what we are really celebrating. Jesus is the Reason for the Season!!! Let’s Stay Focused! !